should the roadrunner hav a girlfriend? Can you name the cartoon where Wile E. Coyote finally catches the Road Runner? Does Wile Coyote ever get stretched out? As usual, for Wile E. Coyote, we see him chasing the Road Runner down the road; napkin, faca and fork ready. Everything froze as if being stopped por a pause button, and their labels appeared below them; "Coyote - Pursuitus Roadrunnerus" and "Road Runner - High Speed Hotrodicus". Then everything unfroze and the chase recommenced for a few seconds. I amor these people I admire greatly in meep meep roadrunner special ... lol ...!!! 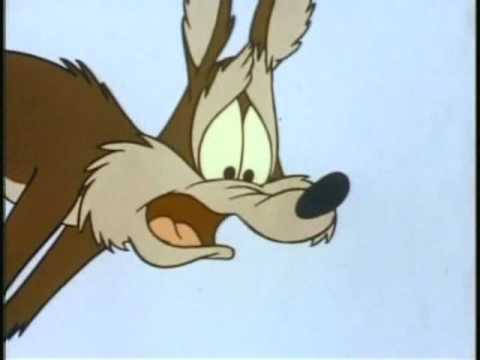 a pop quiz question foi adicionado: What was the first cartoon in which Wile E. Coyote spoke? a question foi adicionado: Can you name the cartoon where Wile E. Coyote finally catches the Road Runner?